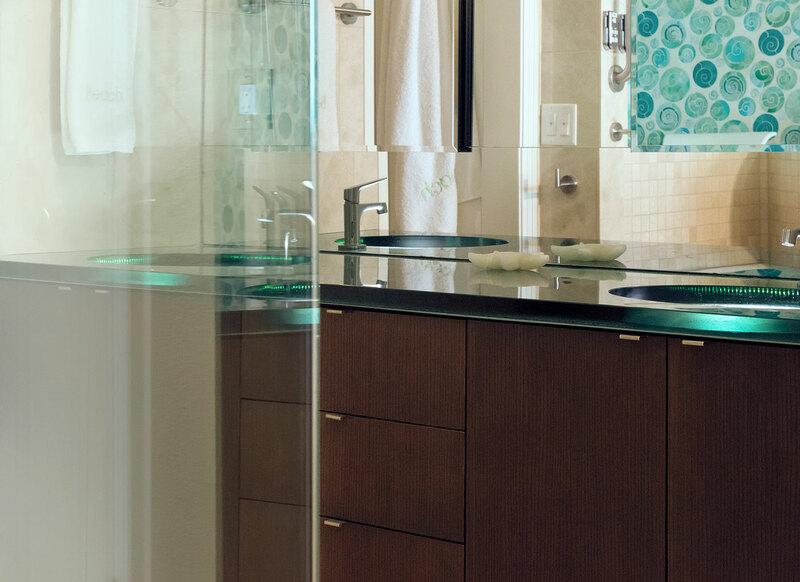 This complete remodel of a privately-owned condominium at Inn at Spanish Head presented the challenge of space enhancement without any major structural changes. In the kitchen, an Anne Sack custom glass full-height backsplash in summer splash colors brightens the super-efficient kitchen workspace. A custom curved glass surface forms the second tier bar top. 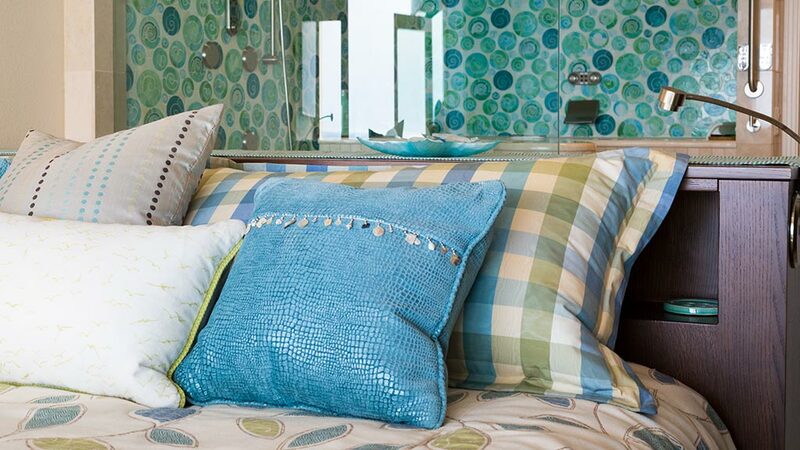 "Becky has become an integral part of any project my husband Tom and I do." 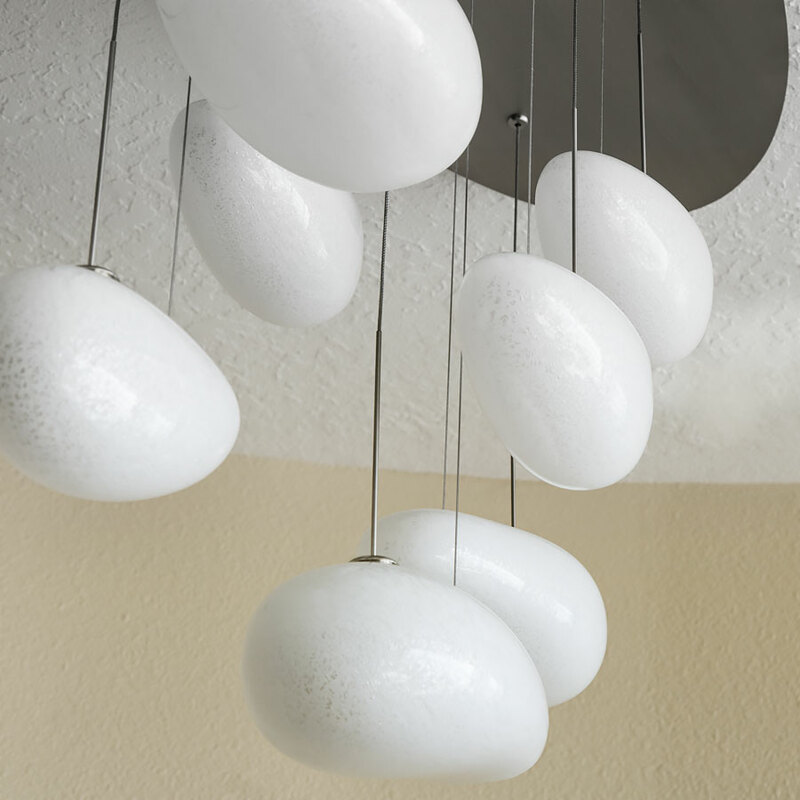 These updated mid-century teardrop pendants float above the dining banquette. 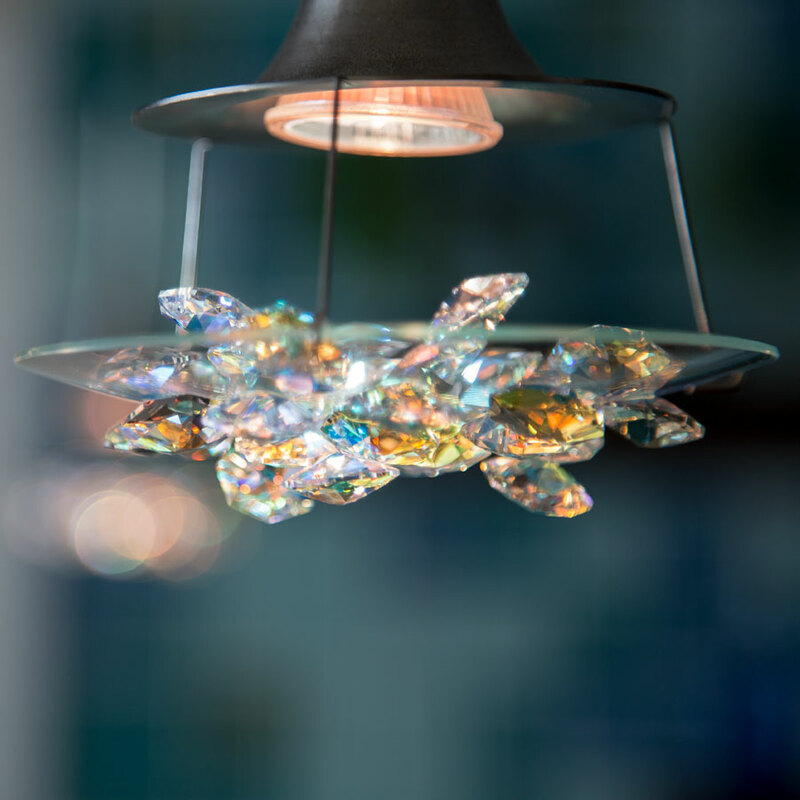 Sparkling Swarovski Crystal pendants catch the eye at the counter bar and direct a focused cone of light onto the surface. 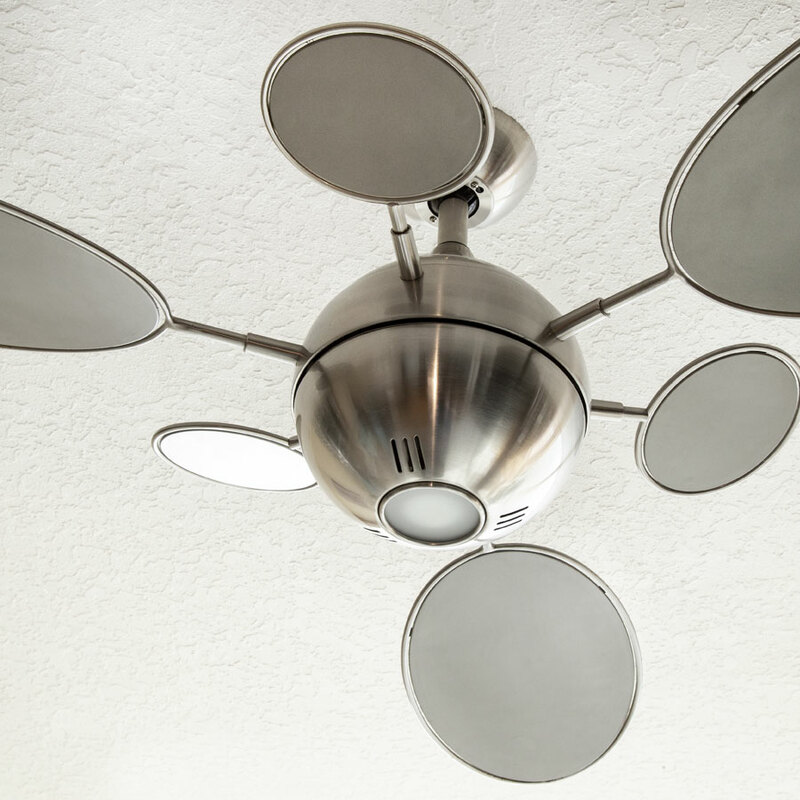 A space-age ceiling fan/light fixture adds a whimisical, retro touch to the living room. 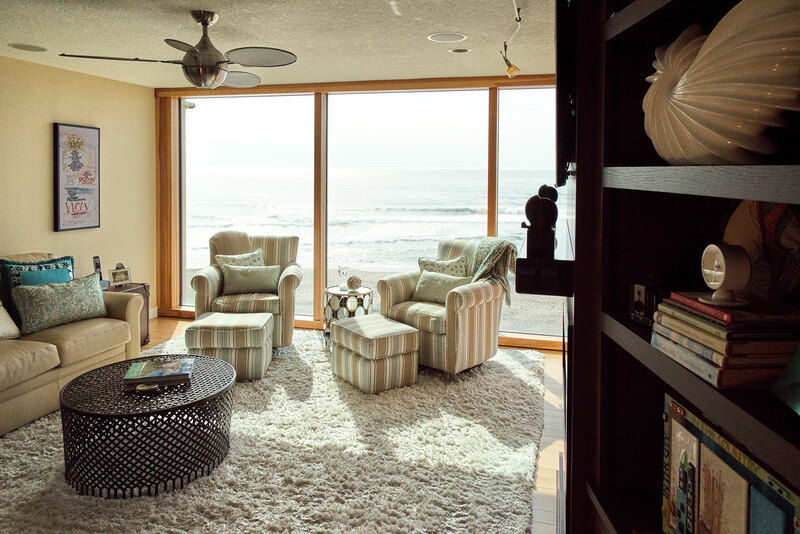 We framed the spectacular ocean view, replacing the aluminum window frames with custom designed clear pine framed windows, adding a rich note of texture and style. 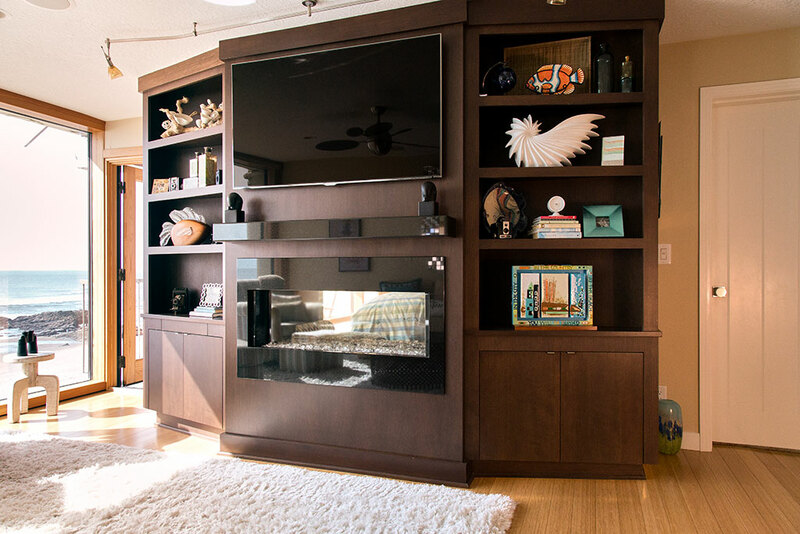 Custom designed and built casework incorporates a see-through fireplace shared by the living room and bedroom. 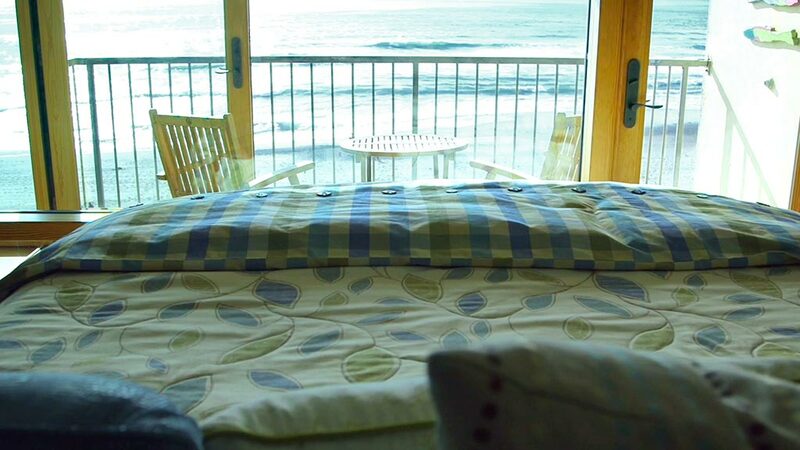 The custom-designed bed faces the beach view and incorporates built-in shelving and lights. 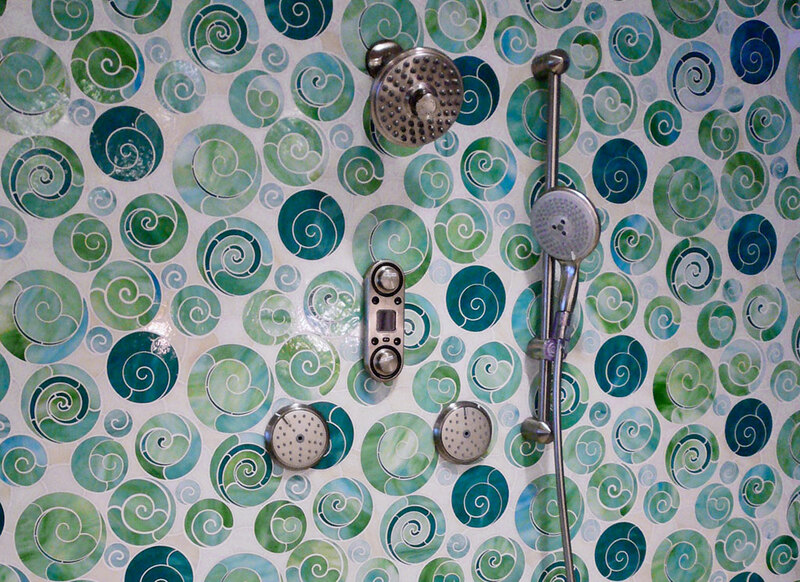 Behind the bed is the glassed-in shower/tub arrangement. 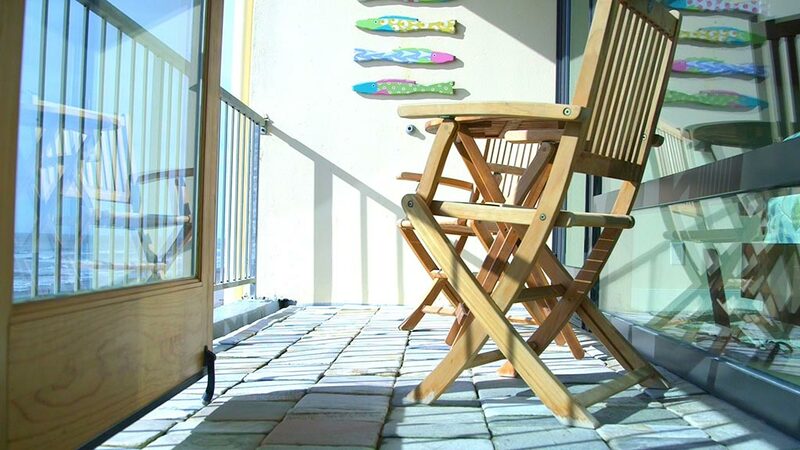 We laid paving tiles on this small but cozy deck. 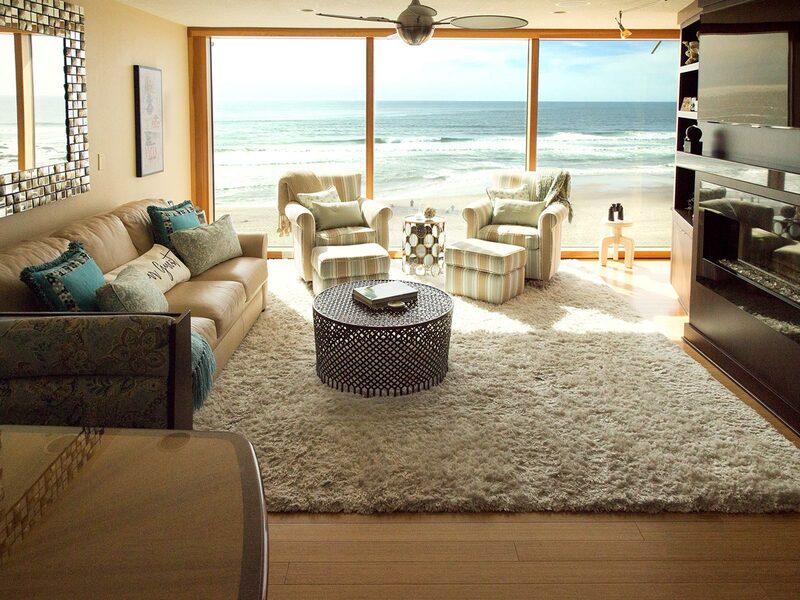 A room with a spectacular view! 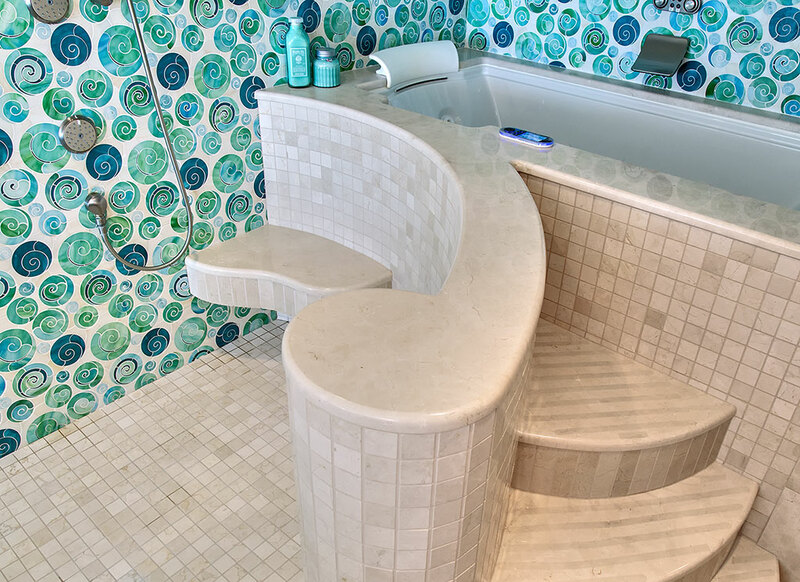 The sole major modification to the suite was this shower/bath enhancement which never shuts out the view. 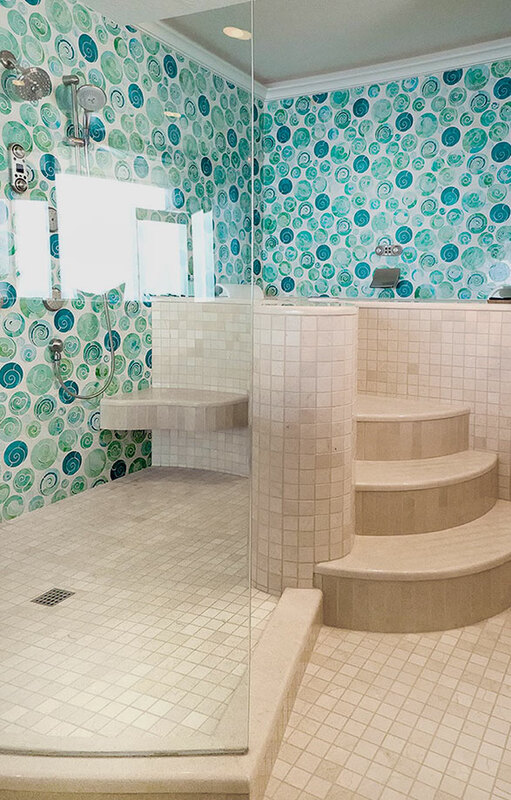 The steps lead to the bathtub, elevated to provide access to the view over the built-in bed.